A six-year-old boy is being treated in hospital for a head injury after being hit by a van as he crossed a road in North Ayrshire. 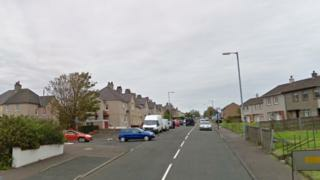 The accident happened on Dalry Road in Saltcoats, near its junction with Anderson Drive, at 08:55 on Monday. The driver of the white van stopped at the scene but had driven off by the time police officers arrived. The injured boy was taken to Crosshouse Hospital in Kilmarnock where his condition is described as stable. Appealing for witnesses to come forward, Sgt Ian Thornton of the Road Policing Department said: "The driver of the van did stop after the incident and spoke to an adult who had been with the young boy. "The driver had left the scene before police arrival and I would ask him to contact police regarding this incident. "I would also ask any witnesses to the crash, or anyone with information that may assist our inquiries, to contact us."